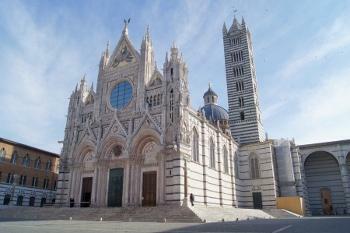 Siena's distinctive black and white striped duomo took almost 200 years to build. By the time it neared completion the Sienese were at the height of their prosperity and had developed a far more ambitious plan: to use the nave of their new church as the transept of an even larger one! The work was interrupted by the Plague of 1348 and the project eventually abandoned, however, visitors can still admire the wonderful view from the facciatone, the unfinished facade, which can be reached through the Duomo's museum. The Duomo's style reflects the transition from Romanesque to Italian Gothic and both inside and out it is filled with many celebrated artistic treasures by a veritable Who's Who of Early Renaissance to Baroque Masters. Duccio di Buoninsegna, Nicola Pisano, Donatello, Pinturicchio, Beccafumi, Michelangelo, and Bernini are but a few of the geniuses who left their mark. One of the Duomo's most unusual features is its flooring of 56 inlaid marble panels that depict figures from mythology and scenes from the Old Testament. Also not to be missed is the famous Piccolomini Library which was commissioned to celebrate the life of the Sienese Renaissance Pope Pio II. The elegantly drawn, finely colored scenes that decorate the walls constitute some of the Umbrian painter Pinturicchio's most beautiful works. A great external stairway connects the Duomo with the Baptistry, itself celebrated for the beautiful bronze reliefs on its baptismal font. Note the small cross on one of the top steps. It is said that on this spot St. Catherine tripped and broke a tooth!